Today’s comments from Andre Villas-Boas are both unnecessary and disappointing as he chose to publicly criticise Romelu Lukaku for the incident last Sunday which left Tottenham Hotspur and France goalkeeper Hugo Lloris unconscious on the Goodison Park pitch. Up until now observers have been unanimous in their defence on Everton’s colossus Belgium striker, who could have done little to avoid the on-rushing Lloris. The fact that Lukaku was booked was ludicrous and the comments from AVB prior to Tottenham’s Europa League match on Thursday evening defy belief. “I want to believe that Lukaku’s leg was not left late to clash into Hugo’s head,” said Villas-Boas. Roberto Martinez is known to passionately defend his players and is expected to come out in full support of Lukaku in his weekly press conference on Thursday morning. What are your views on AVB’s comments? Should he keep his views to himself or does he have just cause to criticise Lukaku’s actions? As Spurs fan, I agree with you: I didn’t feel that it should have been a yellow card. Lloris slid into Lukaku. Lukaku didn’t run into Lloris. That said, it would have been nice if Lukaku had got in touch with Lloris. While we are soul-searching, it would also have been nice if the Everton fans hadn’t booed a player being knocked unconscious. Right on AVB, couldn’t agree more. Not saying Lukaku deliberately went for Lloris but he could definitely have missed him……………. If Lukaku had tried to jump Lloris he would have kicked him in the face instead. Maybe AVB should have a think about this. If Lukaku had jumped over Lloris he probably would have kicked him in the face instead of kneeing him. Fact is Lloris’ momentum took him into Lukaku. Lukaku was running at full pelt if he had pulled up suddenly he’d have probably done his hamstring. This just shows AVB’s managerial naievity. He could have lifted his leg and missed the contact. He left it in. I also agree the Everton fans booing the keeper shows just how stupid they are!!! The Evertonians were not directing the boos towards Lloris. The first round of booing was for Mr Friend and his ridiculous decision to book Lukaku. The booing after that was for the pathetic pantomime that followed with the Spurs medical staff unable to make a decision on whether Lloris should have continued. The only sensible decision to make was to substitute Lloris! why did the everton fans continue to boo lloris after he recovered then? Has loris contacted Lukaku as it is he who injured another player recklessly diving in! The more serious issue here is the lack of punishment for soldado’s assault on Jags! It was a 50-50 ball to be won. Lukaku had every right to go for it. 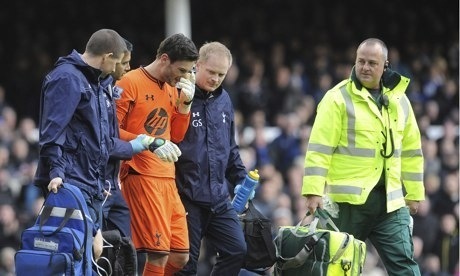 Lloris is fine, no harm done. I was disappointed with the Evertonians jeering and booing Lloris who showed great courage to continue after being knocked out. That’s the sort of behaviour I’d expect from your thick neighbours, not from the blue, normally more sensible side of Merseyside.